Anderson Process offers a variety of general process equipment to drive reliable production and help our customers achieve maximum operational profitability. Click or tap the bar above, then scroll, to view the industry-leading manufacturers we represent for each of our general process equipment technologies. Products Engineered to Optimize Fluid Systems. Demanding fluid-handling applications require precision fluid process equipment accessories that provide reliable performance and help protect and assist the other equipment in the processing line. As such, quality process instruments and fluid controls are essential to efficient and productive operation. For all manufacturers, but especially those in the pulp and paper, paints and resins, and food and beverage industries, minimizing costly shut-downs in order to maintain a healthy level of profitability is essential. Maintaining a safe, environmentally compliant site is just as important, especially for the power generation, wastewater and chemical processing industries. Anderson Process’s flow meters, gauges, motors, valves and actuators, pulsation dampeners and other integrated process solutions help these markets ensure they are maintaining proper fluid management practices. Anderson Process is proud to partner with leading processing equipment manufacturers including Blacoh and Bi-Torq to provide quality process instrumentation and fluid controls. Our pulsation dampeners protect pump systems and components by promoting steady continuous flow, which helps prevent premature pump failure, pipe ruptures, product agitation and contamination issues. 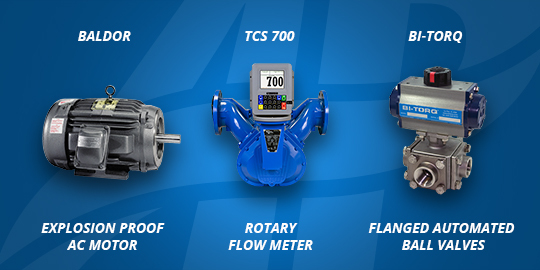 Customers rely on our comprehensive selection of manual and automated valves, available in a myriad of sizes, configurations and finishes, to efficiently regulate flow and deliver leak-free performance. Anderson’s industrial flow meters provide dependable performance under extreme operating conditions, including low flow rates, high pressure and high temperatures. With decades of experience in the fluid-handling industry, Anderson Process knows that even the supporting players in a processing line can have a big impact on profitability. Whether you need a gauge, motor, pulsation dampener or flow meter, Anderson Process’s in-house fluid systems experts will consult with you to determine the integrated process solution that will increase meantime between failures, decrease maintenance costs, drive efficiency and increase productivity.